Are you the proud owner of the newest MacBook Pro or one of the latest Type-C Windows laptops? Congratulate yourself because now thanks to VAVA you can have 4 more ports to play with! 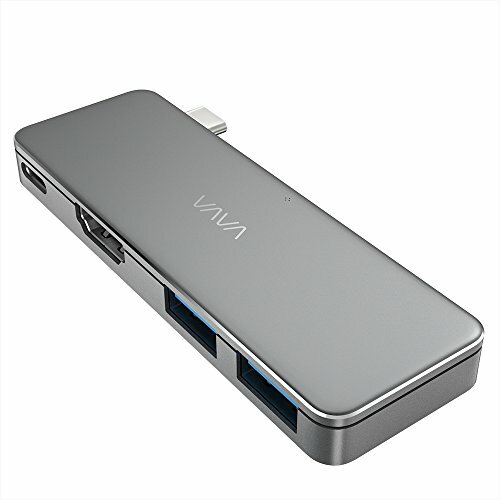 While being compact and easy to connect and carry, the VAVA Type-C Hub adds 1 x Type-C port, 1 x HDMI input, and 2 x USB 3.0 ports to your USB C devices. With just one Type-C port, what peripherals can you connect while your MacBook Pro or USB C Windows laptop is being charged? While the answer is none usually, the VAVA USB C Adapter comes with an in-unit Type-C input so you can charge while having access to multiple peripherals. Say goodbye to image lag while screen mirroring or extending your device's screen on a secondary monitor. Integrated in the hub is a HDMI port so you can project 4K UHD or Full HD 1080p video content on HDTV, other devices' screens, or via projectors. While the latest MacBook Pro and Type-C devices come with no USB port, the VAVA Type-C Hub brings not one but two USB 3.0 inputs available upon connection. Ideal to connect a keyboard, mouse, flash drives, or other USB A connected peripherals.